San Francisco Symphony Orchestra strikes. 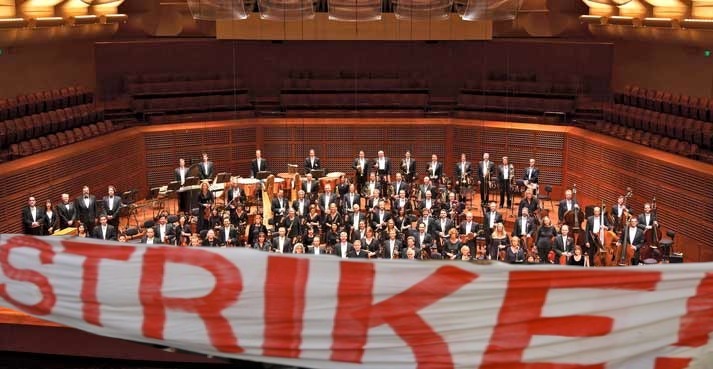 Labor impasse in San Francisco means concert cancellations at Davies Hall. Original image © San Francisco Symphony. Photo editing by the author. 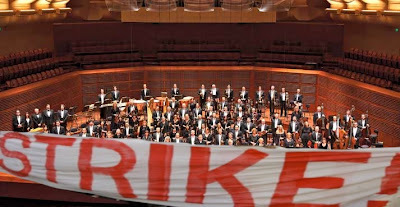 Members of the San Francisco Symphony Orchestra cancelled a rehearsal Wednesday, causing the orchestra to nix a planned performance of Gustav Mahler's Ninth Symphony. The players had been working without a contract since Feb. 10, the same day that they won a Grammy for Best Orchestral Performance of 2012. At issue are player salaries and pensions. "Management is seeking a contract that will not even allow us to keep up with the cost of living, while cutting our retirement", said players' representative David Gaudry in a press statement. Also at issue are high salaries for management, the high cost of living in the Bay Area, and a projected multimillion-dollar renovation of Davies Hall. The players website, Musicians of the San Francisco Symphony has more information on their demands. Orchestra management is asking for wage freezes and pension reductions, in line with similar demands at other ensembles across the country. "“Many of America’s top orchestras are facing similar challenges with increased concert production, pension, and health care costs currently outpacing revenue growth," said orchestra representative Brent Assink. Management's point of view can be read on SFSfacts.org. This over-the-cliff approach to labor negotiations continues a troubling trend that has done major disservice to the classical music industry. Orchestras in Louisville, Kentucky and Atlanta, Georgia were unceremoniously locked out last year. A lockout in Minnesota has virtually nixed the Minnesota Orchestra's entire 2012-2013 season. The players struck one week before the orchestra was due to travel to New York for two concerts at Carnegie Hall under the baton of Michael Tilson Thomas. The musicians are also scheduled to appear at the Kennedy Center in Washington, DC. A Carnegie Hall press representative said "We hope they reach a settlement. We are proceeding with the concerts as scheduled." The programs for the SFS's two projected Carnegie appearences start with a concert featuring Beethoven's Fourth Piano Concerto played by Chinese virtuoso Yuja Wang. The second concert features the aforementioned Mahler Ninth, a specialty of music director Michael Tilson Thomas. As of this writing, Superconductor will review the first of these two concerts.